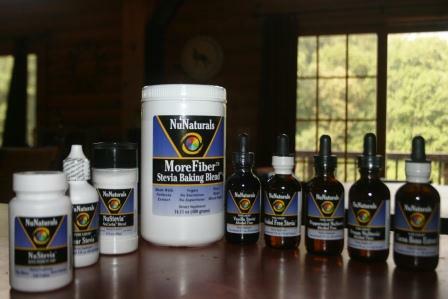 More and more online I've seen healthy families turning to Stevia as a sweetener. I was intrigued. What did it taste like? Was it easy to use as a substitute in recipes; to lower calories and still produce snacks tasty enough that my boys would eat them? NuNaturals was kind enough to send me a large sampling of their products to try, plus tons of recipe ideas. Their products do not contain artificial or synthetic flavorings. They are 100% natural and have zero calories. The first thing we did was sample the flavored NuStevia. It was a hot day, well into the 90s, and we were all thirsty. It only takes 4 drops in a bottle of water to create a refreshing drink - of course you can easily adjust to make a stronger flavor if you want. The boys love the orange. My favorite is the vanilla - I love the subtle sweet taste of it. I have been trying so hard to completely stop drinking diet soda, and Stevia came along at just the right time. I find myself choosing to drink bottle after bottle of Stevia flavored water - if you know me personally you will know how wonderful this is! I feel so much better throughout the day because I'm more hydrated. Preheat oven to 400*. Mix the first 5 ingredients. Once well blended, add the next 6 ingredients, beating as you go. Fold in raisins and pecans, and fill greased muffin tins 2/3 full. Bake for 20 minutes, or until a toothpick comes out clean. Yield: 15 muffins. So the verdict on these? The boys ADORED them! They each ate two a piece, just as soon as they were cool enough to touch! They are tender muffins full of goodness. And I am delighted by the Stevia - it is so easy to use and I love eliminating some of the calories from sugar. I can't wait to test it out in other things I cook. So now, readers, are you thinking you'd love to try it? Well NuNaturals has been generous enough to offer a giveaway. With FOUR winners! That's right four of you will receive one bottle of lemon and one bottle of orange flavored Stevia. Just click on the "Read More" below my signature to enter. Also, if you don't want to wait, you can order some from NuNaturals and use the code BLG1212 for 15% off when you checkout. Giveaway ends at midnight July 10. Disclaimer: I was sent various products from NuNaturals to try. The opinions stated above are all my own. We make a lot of muffins, so I think I would try it in those. I am really interested in learning more about stevia. I have heard some about it, and would like to try it! Thanks for the opportunity! I love stevia; as a diabetic who also needs to be gluten free stevia is the perfect sweetener for me! These look great! I love that they have flavorings in them. Never heard of that sweetner before so Ill need to tell my dad who is diabetic! I love the way you can come up with your own recipes. These look great! Lowfat on the muffins is nice,i will have to give them a try.I tend to dry them out when substituting the fat.I never have tried this sweetener. I know I need to cut back--waaaayyyyy back! The muffins look delicious... Glad the Stevia is working well for you. I gave up my diet sodas about a year ago --and drink alot of water now... It is so much better for us. I can't get past that fake sugar taste. Since I don't eat sweets much I go for the real thing. I'd love to try this! It sounds like a great product! Glad to hear you like Stevia. It is the one sweetner that I can use with no problems!! 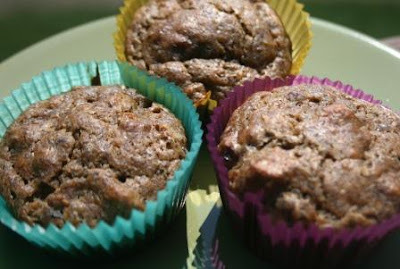 The sweet potato muffins sound wonderful! Congratulations for weaning yourself away from diet soda!! I would love it to use in my tea! I would love to use Stevia for baking! Oh it sounds so..good. I don't use much sugar so I could easily substitute with stivia. The boys sure make good little guinea pigs! I want to try that vanilla water stuff. Those muffins!!! We can hardly stand to look at them! They look sooo good. We tried to grow one of those sugar plants, bit it did not live. We are glad it made your water taste good- so now you are off pop. I love stevia in my coffee! I love to bake, and these would be wonderful for that. I also like to make a home made coffee creamer and the orange might be nice for that. A healthier version of lemonade! I would put it in coffee. I'd love to try this for my mom in some baked goods! I would use it for cookies or muffins. I would love to use Stevia in the drinks that I make. And also my baked goods. kristiedonelson(at)gmail(dot)com Thank you. I'd love to use it in all of my baking. Cookie Bars is what I'd use Stevia for. I would like to implement it in healthier baking. I'd use it in baked goods. In coffee or tea for sure! Yum! Your muffins sound delicioius! I haven't tried stevia yet, but after reading this I think I should. I'd love to cut back on sugar. Soda pop isn't the problem for me, I very rarely drink it. (Root beer floats once or twice a year and seriously, that's all.) It's the baked goods that get me.